Cave Urban recently spent the weekend harvesting Bamboo from Crystal Waters and Kin Kin, with a group of volunteers from QUT. They harvested 1000 poles in preparation for the upcoming installation at Southbank for the Brisbane festival. A big thank you to all our volunteers and Boc from Crystal Waters for helping out. Jeds talk at Woodford.Mandy's photo. Jed spoke on behalf of Cave Urban at the 2014 Woodford Planting Festival. The talk was entitled 'Bamboo in Australian Design' and provided an overview of bamboo globally before addressing the specific issues facing practitioners in Australia. Cave Urban member Jed Long recently presented a lecture entitled "Bamboo in Australia, Cave Urban at Work" to the Bamboo Global Summit in Ho Chi Minh City, Vietnam. It concentrated upon Cave Urban's first research folio on ' Bamboo and Lightweight Structures' and showed several of Cave Urban's recent works. The talk introduced the idea of education and workshops as a means to introduce bamboo to a developed economy. 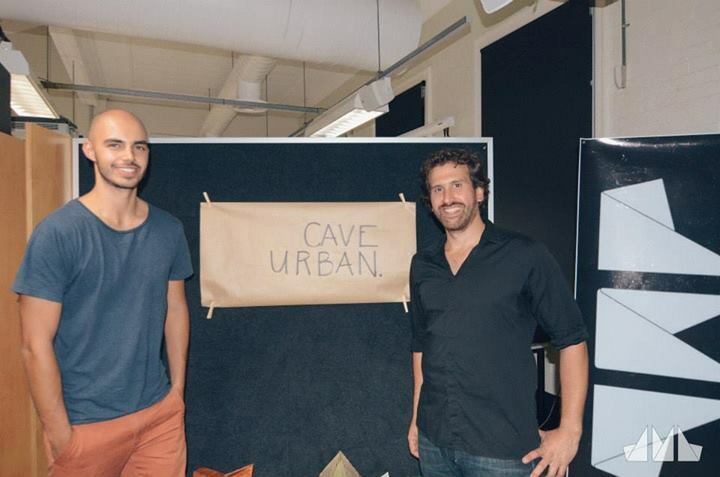 Cave Urban were pleased to speak at the first D/Talk of 2014 at QUT in April. Juan Pablo and Jed spoke about Cave Urban's first research folio, 'Bamboo and Lightweight Structures' and then provided and in depth walk through of the creation of Woven Sky. We would like to thank, all the QUT students who assisted us on that project and look forward to working with you all again in the future. Cave Urban’s sculpture menangang (meaning ‘memory’ in Balinese) was a hit at Sculpture by the Sea, Bondi, taking out the Allens People’s Choice Prize. Inspired by traditional Balinese bird-scarers, the installation made of 222 wind-chimes is a memorial to each of the lives lost in the Bali two terrorist attacks. The original concept for this artwork came from Lachy Brown, a journalist and member of Cave Urban who went on to form a team of volunteers within the collaborative for this particular project. Other members of the Cave Urban collaboration include: Nici Long, Juan-Pablo Pinto, Clary Akon, Kate Ratner, Jed Long, Angel Heradia, Angus Hudson, Kevin Nixon and Alice Nivison, a mix of architects, builders and artists. More than 5,000 votes were cast for the Allens People’s Choice Prize, with Cave Urban the clear winners. The artists will receive $5,000 for the prize. The artists will be recreating menangang at Sculpture by the Sea, Cottesloe 2013, held from 8 to 25 March on the beautiful Western Australian shore.